Some thoughts on home movies, archival docs and the fallacy of universality in cinema. The language of cinema is universal. You hear that expression often enough, and lord knows the sentiment comes from a good place. Despite the obstacles that divide us—borders, languages, cultures, ideologies, religions—a movie’s elemental power cuts through such barriers, connecting viewers around the world and reminding us of our shared humanity. The language of cinema is universal. It’s a lovely notion. But that bromide, beyond being simplistic, diminishes something that’s also powerful about movies. Yes, films can bring us together, but they can also show us worlds we don’t see otherwise—and they don’t necessarily worry about our comfort or familiarity with the terrain. “The language of cinema is universal” suggests that our backgrounds and hardships are all the same, when they are very much not. 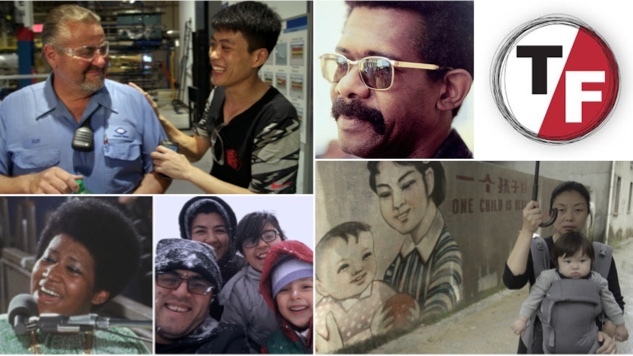 Films can connect us to our shared humanity, but they also can remind us of the difficulties and inherent foreignness of other people’s lives. That recognition topples the illusion of universality: What’s “universal” to me might not be the same for you, or a viewer halfway across the globe. If anything, films can reaffirm the vital differences in everyday experiences, urging viewers to always be aware of the fact that how they see the world isn’t necessarily how others view it. This year’s True/False Film Fest seventh—brought these ideas into sharp relief. Focusing on the best of nonfiction cinema—however one wants to define that slippery term—the festival’s programmers aren’t afraid of subtitles or adventurousness, happily slotting mainstream fare like Won’t You Be My Neighbor? alongside a Congolese travelogue such as Makala, one of 2018’s finest films. Everyone’s festival experience is unavoidably shaped by the movies they see—and the movies they miss—and so no two people can walk away from True/False, which took place over the first weekend in March in the comfy college town of Columbia, Mo., with the exact same impression. But from my vantage point, this year’s edition pointedly argued against the Pollyannaish notion that cinema can bring the world together. Again and again, I was confronted by documentaries that were not trying to tap into the universal. Instead, these movies focused on speaking their own truth—capturing a perspective unique to the filmmaker, which may or may not translate to anyone else. Alongside American films, I absorbed documentaries from Denmark, Mexico, China, Brazil, Japan and, in one case, across the Middle East. If the language of cinema is universal, then it’s spoken with a diversity of accents and tones. As a result, True/False encouraged viewers to spend some time in other people’s realities without worrying if clear connection would be achieved. Navigating through the nooks, niches and cul-de-sacs of nonfiction global filmmaking was the fun. We have enough movies that try to target the widest audience possible. These documentaries asked us to come explore their little corners of the world. During the recent Oscar campaign, an unidentified Academy voter dismissed Roma as “the most expensive home movie ever made.” There are plenty of reasons to disparage that remark, but for our purposes, let’s just say that this voter apparently hasn’t seen a home movie in quite some time. Japanese director Ise Shinichi presented True/False with an actual home movie, of sorts, with Home, Sweet Home, a work that took more than 35 years to complete. The project started off innocently. The filmmaker wanted to shoot footage of his young niece Noa, who suffered from epilepsy and was told she didn’t have long to live, so that his sister would have something to remember her by after her passing. But then an interesting thing happened: Noa kept living. And so Shinichi would occasionally go back to record his sister’s family to check on their progress. Home, Sweet Home has the intimacy and lack of polish of a home movie—it’s meant to be a record, not a carefully composed piece of cinema—but Shinichi’s patience gets rewarded in unexpected ways. While Noa’s disabilities make her life more difficult, she remains a stubbornly optimistic individual. Interestingly, though, those in her immediate orbit begin to have their own troubles, and so the film becomes an accidental document of a family unit combating all kinds of crises. There are no major dramatic fireworks or larger existential pondering in Home, Sweet Home—the film’s insularity is both its limitation and its unassuming charm—but we’re struck by a sadness in how life never quite runs straight, even if home (or, at least, the idea of home) remains a constant. Brazilian filmmaker Maíra Bühler achieves a similar kind of intimacy in Let It Burn, an observational documentary whose dark punch line comes at the end—and won’t be revealed here. Before that final moment, though, this is a straightforward glimpse of the residents of Parque Dom Pedro, a dingy building in São Paulo where addicts of all kinds can receive housing. Bühler isn’t interested in depicting the politics of such a setup or giving us a history of Parque Dom Pedro. Her purpose is to show what addiction looks like. And as we learn in Let It Burn, it looks desperate and sad. There aren’t any drunken angels or wretched souls in Bühler’s film—those narrative tropes are refreshingly absent—but there is a collection of drifting individuals, none of them seemingly close to beating their vices. Even worse, there doesn’t appear to be anyone to help them with their addiction. These residents are forced to survive on their own, and not surprisingly sometimes Let It Burn tumbles into chaotic violence in the form of fistfights between residents. But it’s not all misery: The film illustrates how people, even in the worst of situations, find love, solace and hope. Which isn’t to say that Bühler has crafted some comforting paean to the resilience of the human spirit. If anything, she’s marveling at our ability to compartmentalize—and also, for those not in dire straits, to erase the less-fortunate from our consciousness so that we’re not troubled by their agonies. Bühler doesn’t offer deep portrayals—what we get are casual snapshots as she hangs out in apartments, on the roof and in the elevator with these addicts. As its title suggests, Let It Burn builds slowly, and when its bittersweet finale arrives, it hits harder because of the time thoughtfully spent with these struggling subjects. The plight of the American Rust Belt in the era of globalization, mechanized labor and outsourced jobs is real but, also, a media construct that’s been simplified into a talking point. For those not experiencing that reality on a daily basis, it can very easily become an abstraction. Steven Bognar and Julia Reichert’s American Factory sympathetically illustrates what those everyday pains look like, bringing us into the world of an Ohio automotive plant laid low by the 2008 recession. Several years after the factory closed, a Chinese company called Fuyao moved in, hiring back many of the employees of the old plant and offering hope to an economically depressed community. The American workers would help build windshields for cars and, ideally, along the way discover that Chinese and American employees can live together in harmony. Bognar and Reichert’s film chronicles how that wishful thinking collapsed, but this is not a simpleminded story in which we can grasp onto an easy rooting interest. While American Factory is certainly told more from the perspective of the Americans, there’s an evenhandedness to the filmmaking, which gives the material the sobering weight of grim inevitability. Early on, we can surmise that things may not work out: The Chinese bosses note derisively to their cohorts that the Americans have fat fingers, while the American workers feel alienated by motivational slogans put on the walls in fractured English. American Factory is a portrait of how two cultures clash—not violently or maliciously or even intentionally. Nonetheless, divisions start to form, and overriding financial interests take precedence over individuals, resulting in employment shakeups for both workforces. A documentary as bluntly titled as American Factory may suggest a definitive take on a large socioeconomic situation, but Bognar and Reichert’s film succeeds because it stays micro. Even their conclusions are measured, if also dispiriting. American Factory doesn’t suggest that China is the future—or that America is in decline—but, rather, just how much power corporations have in shaping society and dictating our fates. One of this film’s most crushing ironies is that its true villain is a faceless, insatiable desire for higher and higher profits. Every person we meet in American Factory is at that monster’s mercy. Two historic American moments—very different, but each epochal—were on display at True/False, and both films chose to let the moment speak for itself. The first, Apollo 11, draws from archival footage shot by NASA during the 1969 mission to the moon. Director and editor Todd Douglas Miller drew from countless hours of film—as well as audio recordings that had reportedly never been heard before—to recreate Neil Armstrong, Buzz Aldrin and Michael Collins’ journey, starting with their pre-launch prep and finishing with their splashdown back on Earth. Apollo 11 doesn’t include present-day analysis or talking-head interviews: This is the mission, as it happened. The footage is appreciably stunning, but the wonder of the images cuts both ways. On the one hand, Apollo 11’s matter-of-factness underlines how incredible—how implausible—the moon mission was. (The technology of the 1960s seems prehistoric by modern standards. These were the machines and computers that propelled us to the lunar surface?) But because there’s no real effort on Miller’s part to editorialize—he lets the material tell its own story—the wow factor begins to diminish some, resulting in a sturdy history lesson aided by top-flight digital restoration. It’s a movie about American greatness without necessarily any perspective or angle on that greatness. A few years after the Apollo 11 mission, a different type of cosmic occurrence occurred at the New Temple Missionary Baptist Church in Los Angeles. Over two nights in January 1972, Aretha Franklin (just shy of her 30th birthday) recorded what would become the greatest-selling gospel album of all time—and arguably her finest album, period. The record Amazing Grace has been with us ever since, but the record of that night, shot by a young filmmaker named Sydney Pollack, has been kept away from public view for myriad reasons. Sadly, it took Franklin’s death last year at the age of 76 for that film to finally come to light. Amazing Grace was probably destined to be one of those much-rumored “lost” films that could never live up to its legend once the world got to see it. Even so, it’s a titanic vision of a performer whose extraordinary gift is self-evident, and the movie simply lets her be her magnificent self. As with Apollo 11, Amazing Grace (not credited to any director but completed by music producer Alan Elliott) is a straightforward presentation of archival materials without contemporary context or insights. But that’s enough, because history roars to life in this film, especially whenever Franklin opens her mouth and that incredible voice pours out. Among its many attributes, Amazing Grace brings back the young Aretha Franklin who’s a human being rather than the totemic figure she became. She’s touchingly vulnerable, hesitant, normal in between songs, as if she’s just living her life, not consciously delivering an iconic album. And while the music critic in me will note that it’s a tad disappointing that the film peaks early, with her excellent version of Marvin Gaye’s “Wholy Holy” as the night’s first song, Amazing Grace hums with the thrill of lightning being captured in a bottle—a thrill that’s as much a treat for the eyes as the ears. But with those reservations noted, let me also say that Mike Wallace Is Here rigorously scratches at the psychic scabs that haunted this newsman most of his life. We hear about his battles with depression, the tragic death of his son, and the constant insecurity that he wasn’t a “real” journalist. (He started out as a radio announcer and an actor on TV shows and commercials.) And there’s also careful consideration of what made Wallace such a tart interviewer—his ability to listen and relate, but also his knack for asking tough questions while walking the line between being abrasive and inquisitive. There’s a built-in audience for a film like this—news junkies, 60 Minutes fans, Fox News haters—and Belkin caters to them without challenging them. But although I count myself in Mike Wallace Is Here’s core demographic, I found its brisk, informative, slick presentation rewarding enough, even if it’s preaching to my choir. Boredom and anxiety were the twin engines that powered the creation of No Data Plan, the handmade essay film from director Miko Revereza. This is a different take on the home movie, you might say. The Filipino-born, undocumented filmmaker was riding on an Amtrak from Los Angeles to New York, disappointed to discover that the train had no Wi-Fi, which meant that Revereza couldn’t use his smartphone’s cellular service during the long trip. So, he picked up his camera and started making … well, what exactly? At True/False, I told colleagues that No Data Plan made me think of News from Home, Chantal Akerman’s terrific 1977 nonfiction film in which we see images of New York City (where Akerman lived at the time) alongside voiceover of the director reading letters sent from her mother back home in Belgium. It’s not the best analogy, but what connects the films is a sense of dislocation—how distance makes loved ones feel both closer and far more removed from one another. In No Data Plan, we hear voicemails from people in Revereza’s life, as well as read subtitles that are his exposition concerning what was going on with him at the time. (For one thing, his beloved mother is having an affair, and he’s going to be meeting the man soon.) Like News from Home, No Data Plan is partly an unfiltered story about how America looks to an outsider. They’re both lonely, sad movies—uneasy impressions forged with intense emotions. And in the case of Revereza’s travelogue, the images are infused with a distant terror: What will he do if he runs into border patrol? Afghan filmmaker Hassan Fazili gave viewers an even more harrowing immigrant experience in the form of Midnight Traveler, which chronicles his family’s frightened exodus in the wake of the Taliban calling for his death. (Fazili had made a documentary, Peace in Afghanistan, about a former Taliban fighter, Mullah Tur Jan, who renounced his ways. After that film’s airing, the Taliban killed Tur Jan.) Shot on three mobile phones, Midnight Traveler was chiefly a way for Fazili, his wife (filmmaker Fatima Hussaini) and their two young daughters to document their three-year ordeal, traveling through deserts and snow in the hopes of reaching sanctuary in Europe. But as Midnight Traveler rolls along, it becomes clear that Fazili wasn’t just trying to make an official record of their torment—he was trying to instill normalcy in a situation in which normalcy was nearly impossible. As a result, the notion of documentaries as home movies is especially fascinating in regards to Midnight Traveler, which was the recipient of the festival’s True Life Fund, an annual philanthropic effort to raise money for the subjects of one of True/False’s selections. Like Revereza, Fazili might not have been explicitly thinking about making a film, but the finished product (co-directed by Emelie Mahdavian, who’s also credited as the movie’s editor and writer) is alternately gripping and disarming. A buzzing sound design hints at the unease that Fazili’s family feels at all times, but then there are these seemingly ordinary domestic scenes—brief glimpses into family life in which we see parents and children spending time together, even if it’s in a makeshift refugee camp. Even then, though, the images are fraught. During a key moment in Midnight Traveler, one of Fazili’s daughters enthusiastically dances to Michael Jackson, mimicking his moves. For a moment, viewers’ conflicted feelings about the King of Pop, whose legacy of alleged child sexual abuse was laid bare in Leaving Neverland, melts away in that girl’s happy playing. And yet, her difficult situation—an Afghan without a home—is punctuated by her impassioned singing along to Jackson’s “They Don’t Care about Us,” an attack on racism and bigotry that speaks to this young woman’s reality more profoundly than anyone should have to endure. Some True/False offerings sought to illuminate one culture’s experience in order to communicate to others what had been lost. In the case of One Child Nation, it was the fallout from China’s one-child policy, which was in effect for about 35 years and “incentivized” couples to have only one offspring, preferably male. (The policy ended in 2015, when the country permitted parents to have two children.) The film is driven by co-director Nanfu Wang, who grew up in China during the policy and has subsequently moved to the United States, where she gave birth to her first child. One Child Nation is her record (alongside that of co-director Jialing Zhang) of how this severe measure profoundly affected the country. At only 89 minutes, Wang and Zhang’s film has a lot of ground to cover—probably too much. But everywhere One Child Nation turns its attention is illuminating. Among the standout moments are the directors’ unveiling of old Chinese propaganda films produced to improve public opinion of the policy. Usually, such moments lead to easy laughs—look at the cheesy old ad—but in One Child Nation, those fleeting amusements quickly give way as we learn about the staggering number of abortions that were performed during the era. Wang’s extended family has its own painful stories, and she herself was not immune from the policy’s reach: Her name was meant for a boy. If One Child Nation ultimately proves too diffuse to be any sort of towering exposé on the subject—which, to be fair, isn’t the documentarians’ objective—it’s a starting point that encourages a deeper dive into how a government remade the demographics of its nation and carved permanent emotional wounds into many of its citizens. Filmmaker Juan Pablo González chose to keep his documentary’s tragedy far more miniature. Caballerango takes us to the small, isolated Mexican community of Milpillas and doesn’t worry about filling us in on the specifics. We’ll figure those out as we go along, meeting individuals who all seem to be ensnared in the same general fog of disappointment and/or grief. The documentary is loosely organized around a single incident—the death of a young man, Nando, probably by suicide—but even in the vignettes where he’s not mentioned, a melancholy presence hovers over the proceedings. González eschews a larger context, but in a post-screening Q&A, he referred to Milpillas’ economic downtown as a sizable drain on its communal spirit, and indeed we come to learn that Nando may not be the only individual to take his life in recent times. A largely rural town, Milpillas feels like it could drift away with the wind, and González uses meditative long takes of the beautiful landscape to suggest a place both gorgeous and adrift. Caballerango is a tiny, meditative wisp of a film—it’s just over an hour—but that slightness adds to the poignancy. The meager running time is juxtaposed by the calm power of the hushed images. The documentary is more of a funeral than a portrait. The African-American experience of the late 1960s and early 1970s provides the subtext for Mr. Soul!, a warm overview of the short-lived but influential black television program Soul! Directors Melissa Haizlip and Sam Pollard pay homage to the show and its host, Ellis Haizlip (who was Melissa’s uncle), charting how both reflected a change in the national discourse. There’s an undeniable PBS quality to Mr. Soul!—talking heads tell us why Soul! was important or reminisce about working on the show, in between archival clips of different performers—but it’s also an act of commemoration, not to mention love. Melissa Haizlip’s connection to Ellis isn’t the only element of Mr. Soul! that gives the film the feel of a family affair. The documentary celebrates a bevy of tightknit black artists—everyone from poets to musicians—growing out of the Civil Rights Era, and it makes the case for the show’s lasting significance. (Soul! didn’t shy away from more overt political topics, as a clip of Ellis interviewing Louis Farrakhan can attest.) Of course, the difficulty with celebrations is that they tend to be less incisive than joyous, and so while one may wish for a more thorough investigation into the world Soul! mirrored and shaped, the filmmakers don’t so much connect the dots as they shine a light on a forgotten cultural history. True/False has often enjoyed featuring a film or two each year that blurs the line between fiction and nonfiction. Previous editions have included everything from The Rider to Boyhood, but that fundamental question of “What’s real?” played out in a different way with Untitled Amazing Johnathan Documentary, which for all intents and purposes is a documentary. But the bizarreness of its story leads you to wonder if it’s the filmmaker being fooled or if it’s actually you—or both. The movie begins with director and co-editor Ben Berman trying to chronicle the life and legacy of John Edward Szeles, a magician/comic better known as the Amazing Johnathan. For years, he entertained audiences with his illusions and quips, but tragedy struck in 2014 when he revealed he had a year to live—a diagnosis that inspired him to retire. And yet, he didn’t die, and so Berman decided to document Johnathan’s attempt at an unexpected show-biz comeback. That’s where things get really weird. I’m tempted not to reveal a crucial twist that happens relatively early, because I think it’s important to know as little about Untitled Amazing Johnathan Documentary as you can going into the screening. But suffice it to say that the documentary grapples with the notion that all entertainment is, essentially, a form of put-on. Magicians live to trick us, but so do nonfiction filmmakers in a way—and Untitled Amazing Johnathan Documentary questions how much malevolence is involved in a documentarian’s reshaping of what he observes. To be sure, Untitled Amazing Johnathan Documentary can be a cutesy, overly tidy movie at times. Berman becomes an unlikely central character, and the conclusions he draws from his experience sometimes feel a bit glib. But a documentary like this serves as a sort of rollercoaster ride for the audience, and like those amusement-park attractions, Untitled Amazing Johnathan Documentary is both diverting and fleeting, leaving you disoriented by what you just went through. “Rollercoaster ride” is too mild a phrase to describe what happens in Cold Case Hammarskjöld, a bold, willfully confrontational film that starts off as a possible murder investigation and spirals into a dark revelation that, if true, is absorbing and unsettling. Director Mads Brügger (The Red Chapel, The Ambassador) casts himself as his film’s leading man on the hunt to determine what happened to his Scandinavian compatriot Dag Hammarskjöld, the United Nations Secretary General who died in a plane crash in 1961. Since the man’s tragic demise, there have been persistent rumors that sabotage was involved, and Brügger mounts an impassioned, amusing quest to get to the truth. As with Untitled Amazing Johnathan Documentary, Cold Case Hammarskjöld comes bearing a twist—one that occurs far later than in Berman’s movie but is far more politically significant. The journey to learn that twist is one worth taking, even if Brügger’s overly clever narrative construction can get a wee tedious. (A framing device that’s initially striking eventually loses its luster, although it does lead to one of the documentary’s sharpest jabs.) In the tradition of Michael Moore or Nick Broomfield, Brügger is part investigative reporter, part comic, very large part attention-hog, but his ego is counterbalanced by the growing strangeness of where his investigation leads. Ultimately, it doesn’t matter so much what you think of him because what he uncovers is so potentially revelatory that it’s even more amazing that he’s the one who landed this scoop. Cold Case Hammarskjöld is a study in fascinating, nefarious personalities—by comparison, Brügger’s self-absorbed hijinks are relatively tepid. If there was an embodiment of True/False’s screwy spirit—its refusal to lay down some arbitrary definition for what nonfiction cinema is—it came in the form of an episode of television from 2017 that screened at this year’s festival. Going into the 2019 edition of True/False, I wasn’t sure I needed to revisit Finding Frances, the superb final episode of Season Four of Nathan for You. I’d already seen and been properly wowed by it—shouldn’t I spend my time watching new films? But I had an instinct Finding Frances might be something special in Columbia, and I was right. Seeing the episode at the sold-out, 1,200-seat Missouri Theater was one of my all-time True/False highlights. As for the film, the revisit proved to be a revelation. If you’re not familiar with Finding Frances, don’t worry: Most of the screening’s attendees weren’t either. (When programmer Chris Boeckmann asked for a show of hands before the film of who hadn’t previously seen the episode, a virtual forest of arms shot up around me. A large percentage of folks hadn’t even watched Nathan for You.) It’s a testament to the loyal True/False audience’s blind faith in the programmers’ taste that so many people would happily sample, sight unseen, a cult hit—apparently having no idea what they’d be getting themselves into. Their unfamiliarity with Nathan for You made the screening even more thrilling. It’s one thing to watch that episode alone on your couch—it’s quite another to ride the waves of laughter and shock alongside people experiencing it collectively for the first time. Let’s start with a quick Finding Frances plot description: Show co-creator and star Nathan Fielder decided to go on a journey with Bill Heath, a professional Bill Gates lookalike who had been on a previous Nathan for You episode, to track down the man’s long-lost love, Frances, whom he hadn’t spoken to in about 50 years. Insisting that they used to be a couple—and that she claimed he was the love of her life—Heath wants to reunite with her in his golden years, although he has no idea where she is. That’s not to say Finding Frances is clearly false/phony/fraudulent, but it constantly keeps you questioning whether what you’re watching is true. Is Fielder putting us on? Is he putting Heath on? Are they in cahoots in order to trick us into thinking that this winding tale is real? And even if it’s all completely “real,” how do editing, narration and other filmmaking devices conspire to manipulate that truth? (I’m kicking myself that I didn’t make note of who composed Finding Frances’ brilliant score, which fiendishly mimics all the nonfiction-music prompts, conjuring up feelings of poignancy and suspense with coldhearted, manipulative precision.) Every moment of Finding Frances is utterly genuine and potentially a scam. The not-knowing is the film’s masterstroke. But if Finding Frances captured this festival’s envelope-pushing audacity, another documentary suggested how critical a destination it is on the festival calendar, showing audiences the future of the art form and the artists leading the way. Brett Story premiered her last nonfiction offering, The Prison in Twelve Landscapes, at True/False in 2016, and it was a shattering experience, riffing on incarceration as an endemic problem that remains out of public view. (Tellingly, we never see an actual prison in her film until the very end.) She returned to the festival for another portrait of an invisible phenomenon—actually, maybe a few—that’s rendered equally elliptically and thought-provokingly. I hope it finds an audience, because for my money it’s one of the most incisive How We Live Today movies of recent times. The Hottest August has a novel structural hook: Story spent every day of August 2017 interviewing people across New York City, getting to know them, observing them at their jobs, at their homes or during their downtime. And while she asked them lots of different questions, one common inquiry kept popping up: Do you worry about the future? What Story learns is that, for the most part, the answer is yes. Why people are worried—and how they’re learning to cope—is what powers this remarkable documentary. With the help of wizard editor Nels Bangerter—who previously worked on Let the Fire Burn and Cameraperson, two documentaries absolutely dependent on editing to establish their rhythm and pacing—Story moves from subject to subject, only occasionally returning to an interviewee later in the film. We meet someone working in virtual reality. We meet someone who runs a facility where people can break stuff in order to relieve stress. We meet skateboarding teens. We meet a middle-aged married couple relaxing outside their home. We meet flood victims. We go to baseball games and bars and parties, and we hang out with folks who are checking out that month’s total solar eclipse. And if you remember a cataclysmic moment that happened in America that month, well, you’ll see that integrated into The Hottest August as well—integrated so offhandedly and elegantly that the moment shocks and stings all over again. What precisely is Story driving at? One of the reasons I didn’t stay for the Q&A with Story after the film is that The Hottest August’s beautiful mosaic invites a personal, intimate interpretation—the movie is about a dozen things if it’s about any one thing. Rather than hearing from Story, I wanted to let the movie (and her interviewees) grow in my head, which they did over the rest of my time at Columbia. There’s an apocalyptic tenor to The Hottest August, which touches on global warming and the seemingly systemic belief (especially among her younger subjects) that the future will be bleak—if there’s even a future at all. And yet, the movie finds such warmth in its depiction of these sometimes kooky individuals. Story doesn’t judge her interviewees, and the cacophony of different voices, if anything, speaks to what’s still so extraordinary about human beings, despite their endless limitations and idiocies. The Hottest August had its premiere in Columbia, and it’s the sort of film that will never have the global reach of an Avengers: Endgame. But for those who saw it, the movie might feel just as monumental. True/False is its own little corner of the world, but its modest megaphone amplifies filmmakers’ voices, if you’d care to really listen.